existence to advances in information and communications technology over the past 10 to 15 years that have been truly transformative. Mining differs from other industries in many ways. It is highly variable, starting with uncertainty about the nature of the resource being mined. Mining operations often take place in extreme environments and in far-flung locations. Strains and stresses placed upon mining equipment by rocks of unpredictable size and hardness result in frequent breakdowns. Smart planning and coordination of activities are required to mitigate variability caused by external forces; disciplined execution is needed to eliminate variability that miners create themselves. 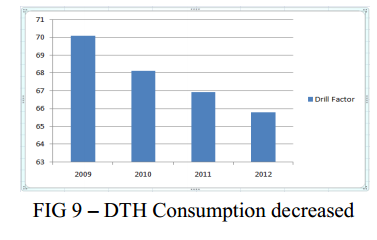 The path to a step change in mining productivity will come through reducing and, where possible, eliminating the variability that has made mining unique. Mines using standardized information technology throughout mining life cycle (called as smart or intelligent mine) could help restore the reputation of the industry and align interests of investors, environmentalist and the communities in which mines operate. From blasting to noise to water monitoring, remote monitoring systems can save users operational time and resources by getting data to mining project personnel without requiring them to spend hours in the field. Automatic information gathering, analysis helps mines to save on operating and maintenance costs and extend asset life, while at the same time complying with stringent regulatory and safety requirements. Figure 1 depicts how information from software, sensors, monitors from different sources go to data centre. BHANDARI ETAL 2 Jaipur, India, 20-22 January 2017 MineAdvanTech performance management iii) asset lifecycle information management. post-blast is critical to the blasting process, for planning. steps by changing charge distribution, initiation timing and sequence for controlling fragmentation size, muck pile displacement, fly rock, ground and air vibrations. 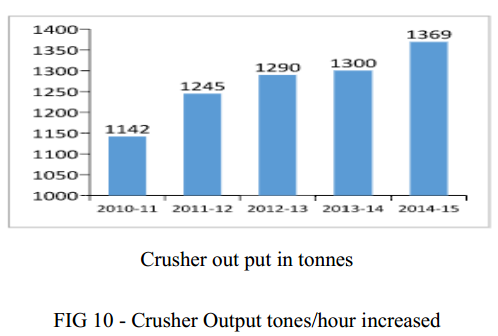 Blasting is made up of groups of tasks, which are performed to produce broken rock with specific fragmentation while ensuring that safety, statutory requirements and/or environmental compliance are met.Being at the very front of succeeding activities such as excavating, hauling, crushing and processing, blasting is also likely to affect the performance of any of these operations (Figure 2). Generally blasting related information is poorly managed with disjointed and unrelated information technology systems managing parts of blasting data. 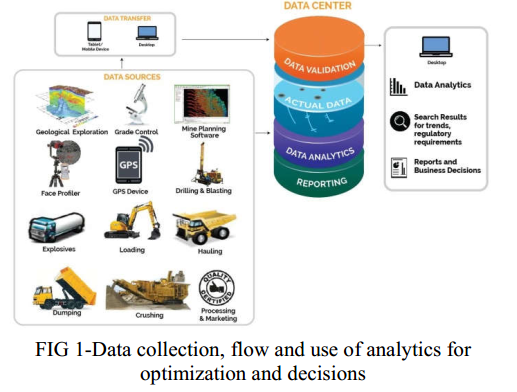 A data management system (Figure 3) not only ensures information storage, but also acts as an intelligent system for optimization of blasting and overall operation. 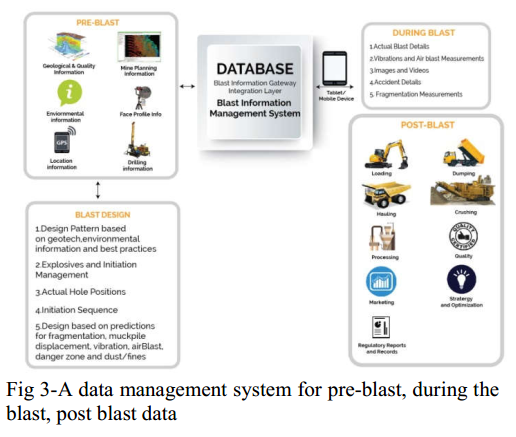 The review and analysis of past data can improve blast design, blast execution and help in the achievement of desired blasting outcomes and downstream productivity, and process improvement. 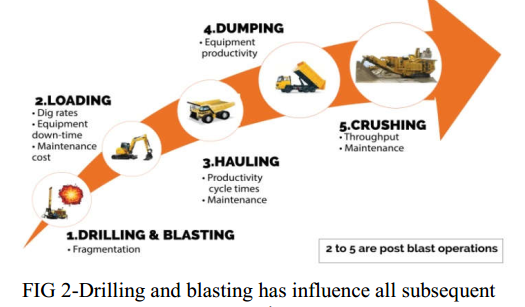 AN EXAMPLE OF DATA MANAGEMENT Blasting is a central activity in mining and quarrying and contributes significantly to overall operations and costs (Figure 2). Fragmentation, an important aspect of blasting result, could affect mucking and crushing performance. However, both could be effected as well by hauling, so that isolated monitoring of mucking could not be sufficient and could lead to faulty conclusions. These considerations lead to overall integrated concept in mining. Thus, it is important that data collections should consider overall concepts in mining. Whereas for other equipment/operations many sensors and monitors automatically send information to data center (Fig 1), details about blasts are not collected as much of it is not automatic. Data collection: pre-blast, during the blast and post-blast is critical to the blasting process, for planning. Based on the database and its search and analysis capabilities, the system can provide opportunities for taking corrective steps by changing explosive charge distribution, initiation timing and sequence for controlling fragmentation size, vibration and flyrock. Data obtained from blast face profiling tool, vibration, flyrock and fragmentation prediction tools, can be directly linked to a database incorporating explosives and accessories used. Modular software may use information to create specific hole by hole explosives loading and create load sheets according to geotechnical zone characteristics and results required. 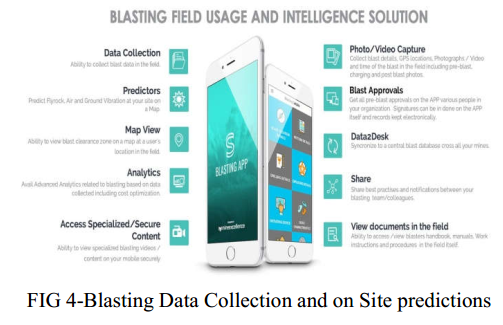 searching options using which the user can look for the records of blasts as per his defined criteria such as blasts between dates, by performance of explosives or initiating system, by vibration limits, by fragmentation size, by location of blasting zone or accident etc. Presentation of analysis of data, compliance reports suitable for regulatory bodies, archiving and viewing of. charging, stemming, initiation devices and timing can be done before executing the blast. Photographs and videos can also be saved using the device. 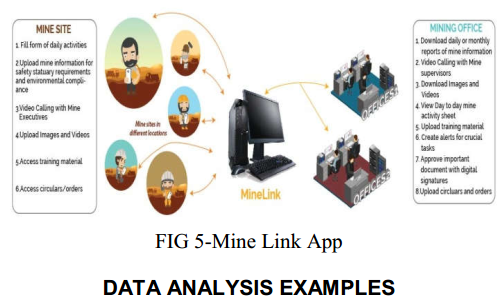 Data can be imported from other devices or tools such as vibration monitoring record When mining personnel return from site, they can sync this data to the web version of the application and export it to the desktop because local storage of mobile devices cannot save large amounts of data. mines within the organ sharing of real time information. This limestone mine in northern Rajasthan designed to product limestone 6.6Mt/a. The ore to over burden ration was 1:0.33 therefore total rock handling was around 9Mt/a. This mine has been able to store blast related data from the beginning of the limestone open pit mine in 1965 until the present day. 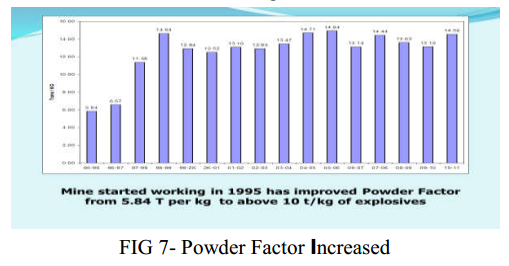 This has helped the mine in decreasing the drill factor from 45 t/m to 75 t/m (FIG 6) and powder factor increased tons/kg to more than 14 tons/kg (FIG 7) reduced and spacing was increased (FIG 8) which lead to less holes per blast (FIG 9)thus reducing costs by 50 per cent (FIG 10) while improving crusher t/h to 1369 t/h (FIG 11). This mine produces 9.00 Mt/a limestone. 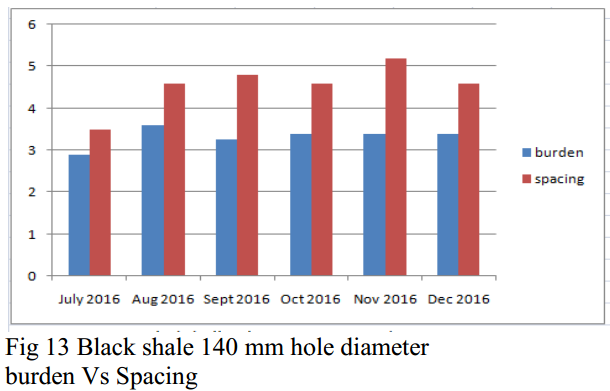 The mine was using the drill pattern with a burden of 5.5 m, spacing of 10.0 m and hole depth of 10.0 m (with these parameters as, powder factor 11.60 t/kg, drilling factor 108.79 t/m, cost Rs 3.0 per ton, tonnage per hole as 1375 t). 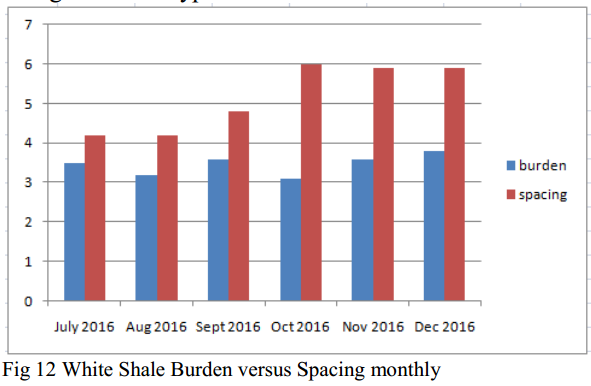 Between 2013 and 2014, the mine was using the pattern with burden of 5.5 m, spacing of 10.0 m and depth of 10.0 m. Analysis of data records of the previous blasts helped and a pattern was gradually changed to a burden of 5.25 m, spacing to 11.0 m and hole depth of 10.0 m. Changes in blast parameters show results in that cost reduced to Rs 2.8/t with powder factor improved to 12.29 t/kg, drilling factor of 111.18 t/m and tonnage per hole increased to 1443 t(per hole getting 68 t more). showed improvement as compared with the previous blast design. 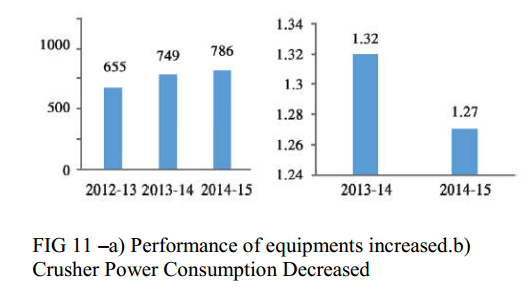 FIG 11 performance of equipments increased andcrusher power consumption decreased. 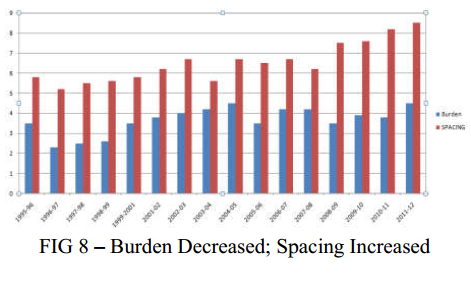 costs and improved powder factor. The use of new technologies in the connected world is inevitable, as it provides the best in class means today of communicating with thousands of points securely and cost effectively. Information and communications technology can be applied to the entire value. chain and lifecycle of mining and mineral extraction. There is no doubt that the future landscape of mining will be a digital landscape. Companies must invest in tools and analytics that will allow them to become a modern digital mining company. The future will be digital- digital camera, videos, electronic document storage, network data collection, intelligent search software to see trends and optimise operations. The minerals industry is no exceptions, even though it can be slow to accept new technology. Mining industry as we have seen it in the past has been a laggard when it comes to technology adoption. It is time new tools are used tlike Mobile Apps used for data collection and analysis.